With a motive to proffer the best in class solution for the corrosive environment, we are here with the quality approved range of the stainless steel Y strainer, a strainer that has gained the high edge fame for its ability to outperform against corrosion. The introduced stainless steel Y strainer is considerably used in the chemical industries, where the corrosive nature of the chemical is common. Other than, food and pharmaceutical industries have accepted our stainless steel Y strainer for delivering completely contamination free environment, is what essential to maintain the high level of hygiene. This makes us also prominent as a stainless steel Y strainer manufacturer worldwide, thanks to our prestigious consumers for showing trust in our Y strainer. This stainless steel Y strainer are composed form the 304 grade SS material following the international quality standards, which each is tested and assured to meet the API standards too. 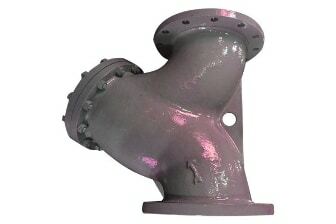 Different screwed, socket weld and but weld ends are available in this Y strainer to make it suitable for any application. This stainless steel Y strainer can is available in the far reaching collection, which can withstand 150 psi to 750 psi operating pressure and 100° F temperature. Besides that, different size of perforated screens (304 – stainless steel) is available to match miscellany wants of the end user.